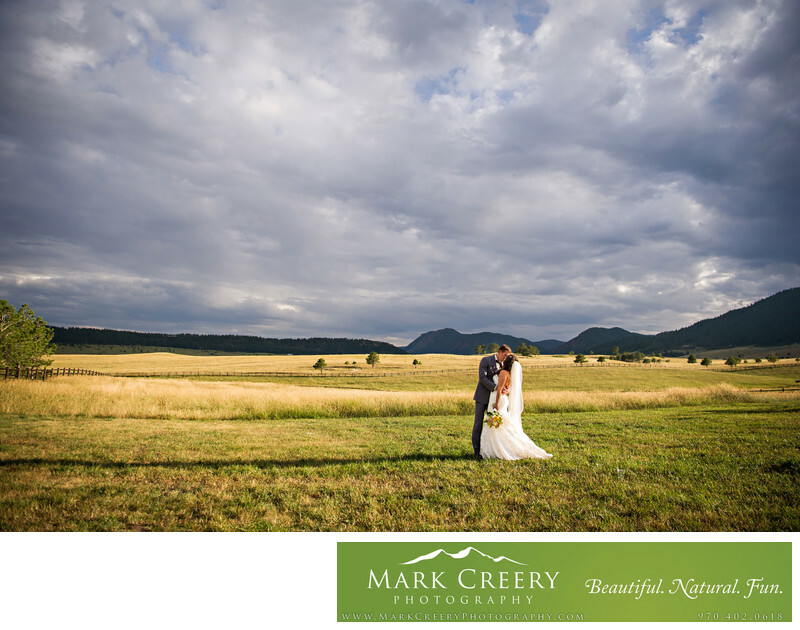 During the summers in Colorado when the sky starts to cloud over in the afternoon it can be the perfect time for wedding portraits. Although the deep blue skies that are beloved get covered over, the usually harsh summer sun gets filtered beautifully through the largest light diffuser a photographer can ask for. The end result are some amazing light. Even, like in this photo, when the sun peaks through, it can create for dramatic lighting if the sun is low enough. In this case it was just peaking over the mountains. The bright light helps me capture the vibrant colors in the scene, and bring out the depths and drama in the clouds. The couple kissing is the cherry on top for producing a top-notch romantic portrait. Of course, the downside of the clouds is that they might be carrying rain overhead. This is a consideration when planning your ceremony time, so keep this in mind. I can still photograph in the rain as long as people have umbrellas and are comfortable enough. Luckily, my expensive camera gear is weather resistant! The open fields at the ranch are a stunning canvas to photograph on. Spruce Mountain Ranch is located in Larkspur, Colorado. Contact: (719) 484-0800, info@sprucemountainweddings.com.